Of course racism, or at least speciesism, is behind a lot of this, and the recent integration of the goblins into Ankh-Morpork has put a lot of backs up. 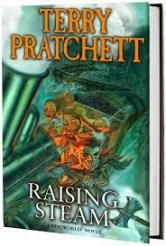 Pratchett's metaphors for the real world are getting, if anything, even less subtle than ever, but it's hard not to like how eloquently and passionately he argues against the sort of people who fight against change on principle. This isn't one of his funnier books unfortunately, and a lengthy buildup in the second half of the book ends in anticlimax, although that's kind of the point. Still enjoyable though.